November 17, 2011 Adri H.
When the editor at Twist Collective approached me to do an illustration, my heart skipped! Lately, I've been focusing a lot of my time on knitwear design and graphic design, but hadn't had much opportunity to illustrate for someone else. So, needless to say, I graciously agreed! Here and here are the illustrations is within the Winter 2011 issue. The goal for the project was to illustrate an Incan folktale about how alpacas came to be beasts of burden for the Inca people. Stylistically, I took inspiration from a 16th century chronicle by Guaman Poma (aka Felipe Guaman Poma de Ayala, aka Huamán Poma). 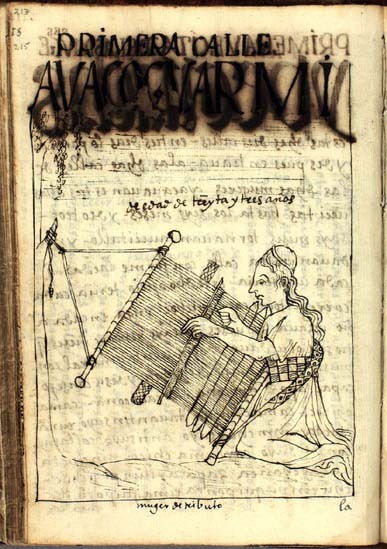 He was a Peruvian nobleman who, in detailed illustrations and notes, wrote about the Incan chiefs, people, etc. You can see the chronicles via the Danish Library System here. With such beautiful detail and lovely aging to the page, I sought to imitate some of the drawing conventions he used such as the imaginative perspective. So, keeping that in mind, I used pen & ink on film to try and capture the line quality and perspective while still telling the story (as retold by Daryl Brower). I hope you enjoy the story and illustrations! Check out the whole story here.